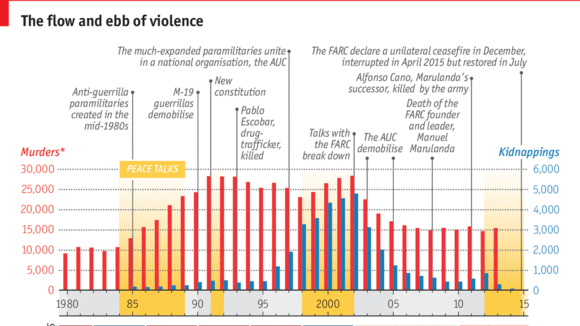 Scooper - Technology News: After 50 years of conflict, could Colombia be on the brink of peace? After 50 years of conflict, could Colombia be on the brink of peace? Colombians are close to bringing to an end the oldest and only remaining armed conflict in the Western Hemisphere. After more than five years of negotiations with the FARC (Revolutionary Armed Forces of Colombia), we can say that we have reached an irreversible phase that will put an end to more than 50 years of a cruel and costly war. Last but not least, we implemented a radical change in our foreign policy, which led to an improvement in our relations with our neighbors and the rest of the region. This facilitated their support of our initiative and thus the beginning of the peace process. This peace process is groundbreaking in several ways. We have placed victims (more than 7.5 million in our case) and a comprehensive system to guarantee their rights at the center of the solution to the conflict. We have also agreed to create a special jurisdiction and tribunal to guarantee that those responsible for international war crimes are investigated, judged, and condemned as stipulated in the Rome Statute of the International Criminal Court . This is the first time that a guerrilla movement has agreed to disarm and be subject to transitional justice. Despite traditional spoilers, mostly of an internal nature, many of whom oppose the process for political reasons, I am confident that we will put this conflict swhere it belongs – in the history books. Reshaping the reality around us is our duty to future generations. When we reach an agreement, when we stop killing one another after a half-century of war, we will remove a heavy burden that has stalled our progress and finally enjoy the opportunity to write a new chapter of prosperity and modernity for our country.